When I went to Dukes Farm I took away with me some old photos I had found at my parents and decided to make an album. I've not had the chance to share the layouts I made on her yet but the good news I have photographed them and will be sharing them shortly. 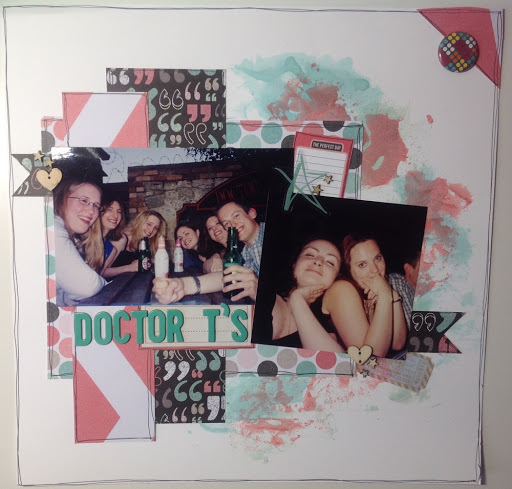 One layout I can share though is one I made this last weekend for the Scrap our Stash sketch challenge. 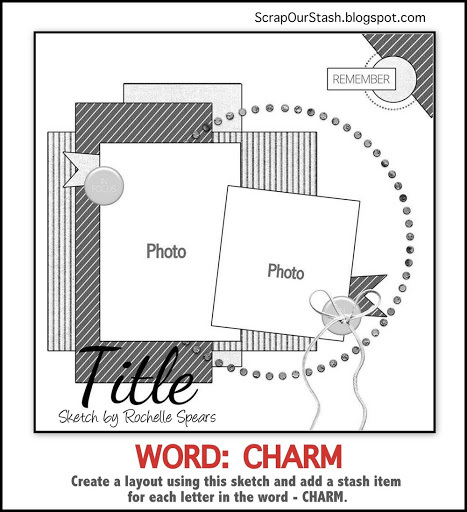 This was the sketch with the added twist of using elements to spell out the word CHARM. And this is the layout I scraped. I chose photos from a night out for my birthday to one of our old haunts Doctor Thirsty's, or Doctor T's as we called it. I used: C- Cardstock, Chevron paper from the Cut & paste collection H- Heidi Swapp star and ticker embellishments, Hearts A- Amy Tangerine thickers, Acetate embellishments R- Red M- Mists, MME papers Make sure you hope over to the blog to join in! What a fantastic LO! Love the details and stash use! Great take! Thanks for your entry in our challenge at Tuesday Scrap Our Stash! Loving the colors and the painted background! Nice job with the stash word challenge and the sketch. Thanks for sharing at Scrap Our Stash!! Awesome background! Great take on the sketch and stash challenga. Thanks for joining us at SOS! I love the painted background. Thanks for joining us at Scrap Our Stash! Great background, and I love that "" paper! Thanks for taking the challenge at Scrap Our Stash! Wonderful page! Love your take on the sketch. Thanks for joining us at Scrap Our Stash. Great take on the challenge. Love the background work. Thanks for joining us at Scrap Our Stash.